You reached level 10 in Wake Racing. You reached level 10 in Climbing. You reached level 10 in Bowling. You reached level 10 in Target Shooting. You reached level 10 in Soccer. You reached level 10 in Tennis. You activated 8 mines in a single Wake Racing event. You completed 10 no-handed tricks in a single Wake Racing event. You performed a no-handed trick in a Wake Racing event. You got a perfect boost start in a Wake Racing event. You survived an opponent's grab in a Climbing event. You knocked off three opponents with a single Blast Wave in a Climbing event. You bowled a turkey in a Bowling event. You cleared a split in a Bowling event. You knocked down the last pin using the Meteor Bowl power-up in Bowling. You earned 500 points while affected by the Blind Fire power-up in a Target Shooting event. You shot 3 bullseyes in 3 seconds in a Target Shooting event. You won a Target Shooting event without activating a power-up. Scored 4 goals with headers in a single game of Soccer. You punched out 4 shots at goal in a Soccer event. You saved 5 shots in a Soccer event. You hit 4 consecutive aces in a single Tennis event. You scored 5 points by hitting the white line in Tennis. You scored with a lob shot to earn the 'Klobber' player title in a Tennis event. You played Soccer and filled your power-up meter 7 times. You earned 250000 coins in Kinect Sports Rivals. You bought an item from each sports store in Kinect Sports Rivals. You scanned yourself as the opposite gender to your original Champion in Kinect Sports Rivals. You won your first Wake Racing event over Xbox Live. You won your first Climbing event over Xbox Live. You won your first Bowling event over Xbox Live. You won your first Target Shooting event over Xbox Live. You won your first Soccer event over Xbox Live. You won your first Tennis event over Xbox Live. You won your first Wake Racing event. You won your first Bowling event. You won your first Target Shooting event. You won your first Soccer event. 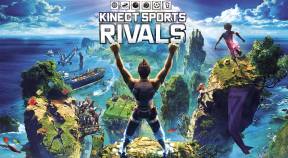 You won a Rival Challenge in Kinect Sports Rivals. You threw all opponents off the wall and won a Climbing event. You won a Climbing event without activating a power-up. You won a Bowling event without activating a power-up. You passed through all gates in first place over 2 Wake Racing events. You won a Soccer event without conceding a goal. You joined a team in Kinect Sports Rivals. You learned to play each of the six sports in Kinect Sports Rivals. You sent a Rival Challenge to a friend in Kinect Sports Rivals. You blew up an opponent with a mine in a Wake Racing event. You came back from 40-love down to win a Tennis event. You won your first Climbing event.